The first step is deciding where to put your garden. The one rule of thumb that we always abide by: put your garden in easy reach of your kitchen. You are less likely to add that tablespoon of fresh marjoram if you have to trudge across the yard to the garden that you’ve tucked out of sight, behind the garage. Make use of the space right outside of your kitchen door; it should be as easy for the cook to head out of that door as to head into the pantry for the dried version of your herb. 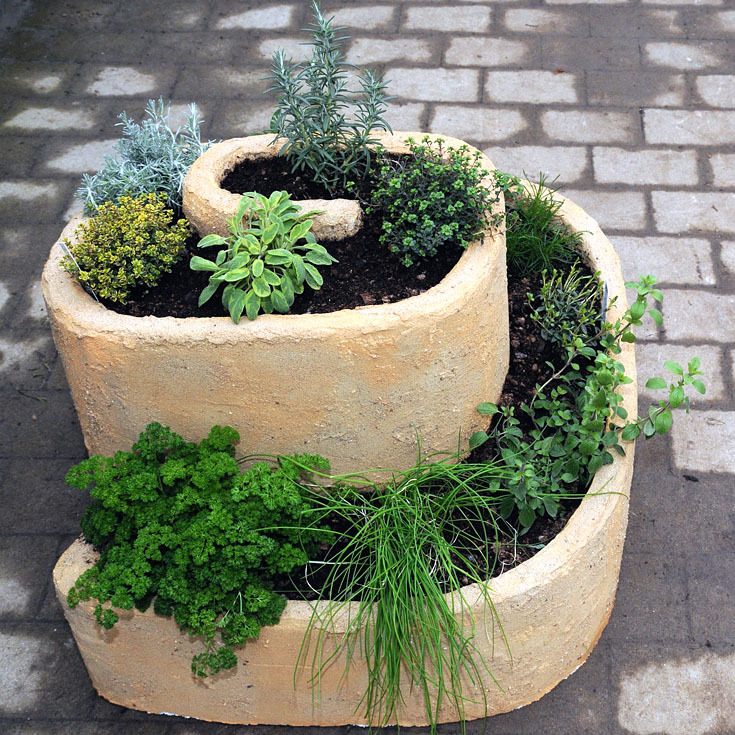 You don’t need a lot of space, and if you are really limited, then grow these culinary herbs in pots. A nice variety of culinary herbs can be grown in a 6’ x 6’ plot, although if you’ve got the space, go bigger and add some variety with annual flowers and veggies to make a real statement! In addition to location, you need to make sure that your garden will get enough sunshine as herbs need at least 6 hours of sunlight a day. Good draining soil is crucial, as well as healthy soil. And make sure that you have easy access to water. Deciding which herbs to grow is as easy as thinking about what you like to use in your cooking. Review your favorite recipes, take a look at some new ones and make a list of herbs that you would love to enjoy straight from your OWN garden. Yes, no more “fresh herbs” from the grocery store because they really aren’t all that fresh and they are really expensive! Consider trying a variety of your favorites ~ if you love chives, then include garlic chives as well. Can’t live without fresh basil? Then grow a few types for variety. We suggest that you go with the ‘usual suspects’ but be sure to add a few that you have not tried! With over 160 varieties of herbs, you should be able to find a few new additions to your lineup! Make sure that you understand the growing habits in order to provide enough room for their return; you don’t want an herb ‘crowding out’ a neighboring plant as it is not good for either plant. What you need to know about any herb includes whether it is an annual, perennial or biennial. How big it will grow both in height and width. Does it prefer full sun or a little shade? Just make sure to take a look at the product page to get an idea of their ‘full potential’ and accommodate them! A word about choices: most herbs are herbaceous (non-woody) but some may grow into semi-shrubs with woody stems if you live in a temperate climate. These include herbs such as lavender and rosemary. Herbs are classified as annuals (one season of growth), biennial (two seasons in which leaves are produced in the first year followed by flowering and seeds the second year and usually reseeding themselves) or perennial herbs with ongoing growth lasting many seasons. We encourage you to use a variety of herbs that encompass all types mentioned. 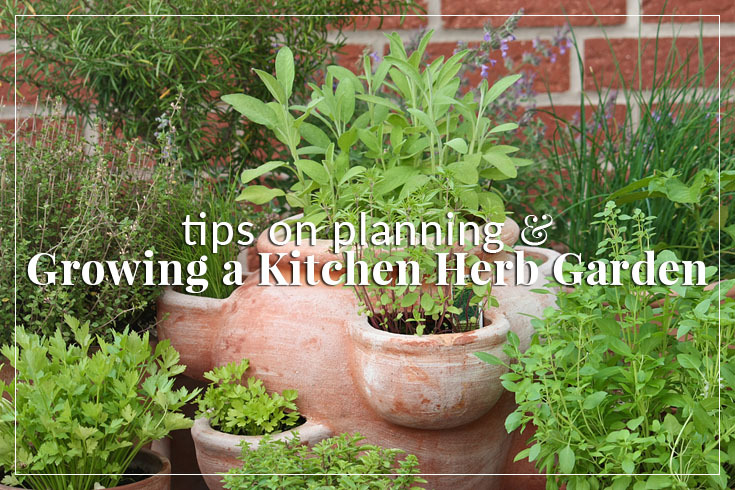 After you’ve chosen your herbs, and done a bit of research on them, begin your planning. The good news: you don’t have to be a landscape designer to sketch out a simple garden. The overall dimensions of the garden will dictate how much space you have, and the individual characteristics of each herb will let you know how many plants will fit into that space. Trust us when we tell you that the Lemongrass that arrives in a 3.5” square pot will grow into a 4’ tall bush, with a diameter of 3’! The other consideration in planning is harvesting your herbs. You want to give yourself easy access to all of your plants, so if that means creating enough space for a path or designing it so that you can access from the edges. It’s your garden and your design, but don’t forget the purpose ~ this is a working garden! If you are creating a border, make sure that you put your tall plants in the back, and the shorter herbs in front. Again, you don’t have to be a designer to grow a great garden, but you do need to keep a few things in mind. Herb plants have color and texture, so consider those aspects when planning your garden. Arrange the plants to vary in terms of size, shape , color and texture. And, above all, have fun. Herb gardening is not rocket science, and it should be fun. Use the next few weeks to sit down with a pencil and paper, and our website, and start to plan. Once you have your final list, place your order and remember that we’ll ship at the right time for your zone. Once they arrive, we’ll be here to help you along the way. And, come mid summer, you’ll be amazed at the size and quality of those herbs that you were just dreaming about way back in February! Thank you for this article. It is informative, easy to understand and doesn’t talk down to the reader. I have an established herb garden on the south side of my home that lies beneath my kitchen window over the sink & has a faucet right there! It’s good to know I’m doing some things right. I’m SO happy I put it there. It needs a great deal of clearing of invasive grasses and weeds now, but I hope to reclaim it this year. There are two different chives, regular & garlic, that have have increased enormously over the years & desperately need thinning out. LOVE the garlic. Question: Is the fun container pictured w/the article a hand built fired clay piece or is it cement? …. & where did you find it? It’s MARVELOUS! It is a good idea to put name markers for each herb in your garden so others can identify them in case you need to send someone else to the garden. I have used herbs in my flower beds as edging plants[thyme] and fillers-lemon grass, rosemary etc. 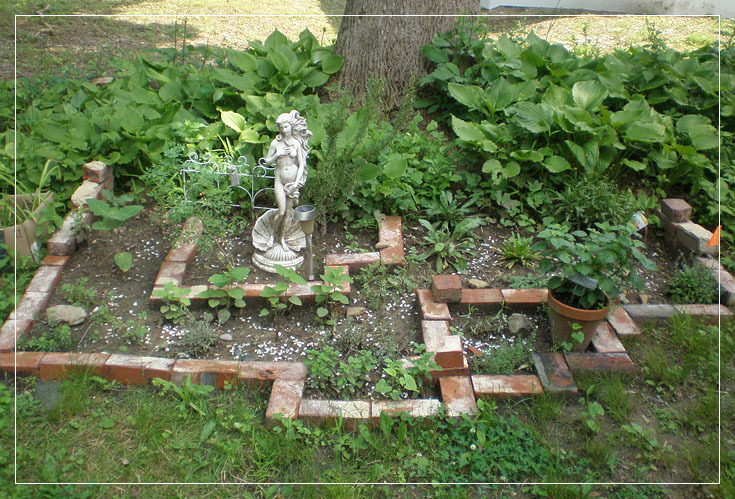 especially if you don’t have an ideal place for a dedicated herb garden. Would someone from the herb exchange consider joining me on a live segment on mangiaTV?